United American Cemetery is in Columbia Township north of Duck Creek with an entrance east of Kennedy Avenue. 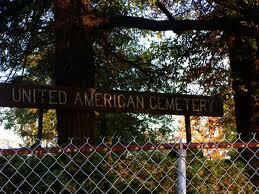 The cemetery was founded in 1844 by United Colored American Association and dedicated three years later. The Association was incorporated in 1882. In 1884 the United Colored American Association owned one and one-half acres of land. It is said to be the oldest Black cemetery in Ohio. The United Colored Association’s early officers included Robert Gordon, a former slave who came to Cincinnati in 1847 and purchased his freedom and became a wealthy coal dealer. Hartwell Parham was an affluent tobacco merchant and father of William Parham – the first Black nominated to the Ohio State Legislature. 1908 Wendell P. Dabney (1865-1959) founded and edited in Cincinnati one of first Black newspapers in the United States called the Union. Dignitaries buried in the cemetery include John Isom Gaines - pioneer Black educator whose remains were first interred in Avondale Black Cemetery and moved in 1884. The first Black church was named after him. Horace Sudduth, a 20th century real estate mogul and financier who owned the Manse Hotel in Walnut Hills, where the most prominent Black celebrities stayed at, such as Duke Ellington. The cemetery became increasingly neglected over the years. Councilman Charles P. Taft, trustee of Spring Grove Cemetery was appointed to operate the cemetery. In 1968 he transferred the cemetery to the Union Baptist Church. There is no written account of a burial site in Madisonville for Blacks prior to the United American Cemetery. In the City of Cincinnati, Blacks were buried in Potter’s Field alongside the Millcreek and Avondale’s Black Cemetery. It has been reported that both Thomas Funeral Home on Whetsel Avenue and Laurel Cemetery on Bramble Avenue would not handle funerals for Blacks until approximately 1981.